An Israeli military drone fired, on Wednesday afternoon, a missile at Palestinians near the Great Return Camp, east of the al-Boreij refugee camp, in central Gaza. Media sources in Gaza said the missiles targeted five young Palestinian men, but did not cause any casualties. The army claimed it targeted Palestinians “flying flammable balloons into nearby Israeli lands”. The attack came hours after the Israeli navy fire many live rounds at Palestinian fishing boats, in Gaza territorial waters, in northern Gaza. 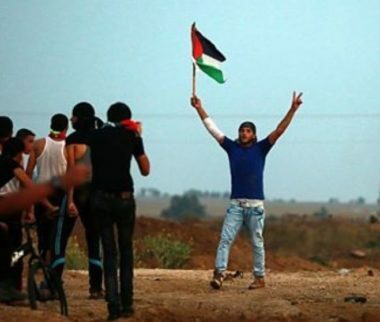 On October 29, 2018, a Palestinian, identified as Mohammad Abdul-Hai Abu Abada, 27, was shot and killed by Israeli soldiers during the 14th Naval Procession in Beit Lahia, in the northern part of the Gaza Strip. On October 28, the soldiers killed Abdul-Hamid Abu Thaher, 13, Khaled Bassam Mahmoud Abu Sa’id, 14, Mohammad Ibrahim Satri, 13, Yahia Bader al-Hasanat, 37, in the Gaza Strip.